Salini Impregilo has initiated work on Lot 2 of Line 16 of the Grand Paris Express that will serve communities in the northern and eastern parts of the metropolitan area. The Lot 2 project, valued at €718.8 million, involves the excavation of 11.1 kilometres of tunnel and the construction of four stations at Aulnay, Sevran-Beaudottes, Sevran-Livry and Clichy Montfermeil, along with 11 ventilation shafts. It follows a contract also won in March with joint-venture partner Nouvelles Générations d’Entrepreneurs (NGE) to extend Line 14 to the Orly airport to the south of Paris. The two projects mark the return of Salini Impregilo to France after more than 20 years. Between 1992 and 1998, it worked on the Paris rail lines Est-Ouest Liaison Express (EOLE) and METEOR (Metro Est-Ouest Rapide). 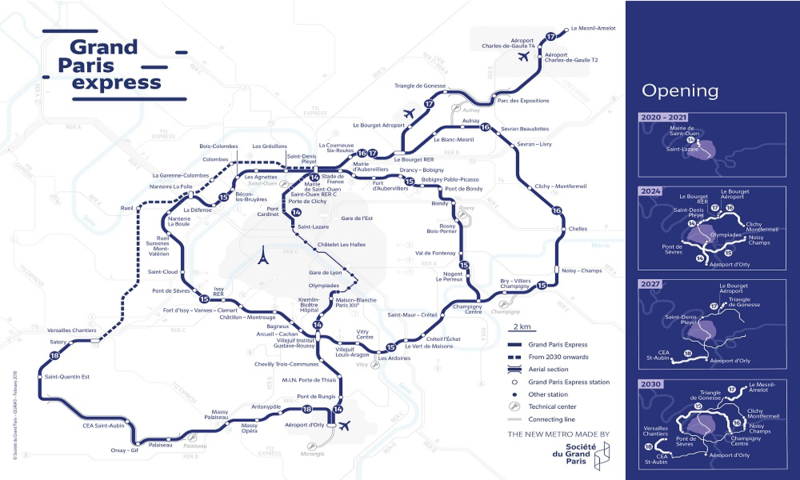 “We are very proud to be able to work on a second project within the parameters of the Grand Paris Express, given the strategic role played by the transport system in the city, as well as the long-term vision that has led to the development of the largest initiative of sustainable mobility in Europe,” said CEO Pietro Salini.